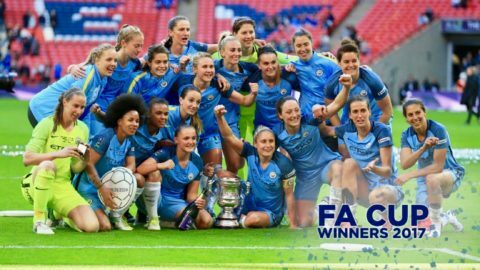 The record Wembley attendance earlier this month for the Women’s FA Cup Final has underlined the growing profile of this branch of the game and The Sports Office team were delighted to see client club Manchester City secure victory under the world-famous arch. Man City Women beat Birmingham City Ladies 4-1, in front of a bumper 35,271 crowd. The winning side featured the likes of England skipper Steph Houghton and star US signing Carli Lloyd. As well as the “Light Blues”, women’s teams at Chelsea, Arsenal, Southampton, Oxford United and Bristol City are all users of “The Football Squad’’, The Sports Office’s performance management system for elite soccer. This growing sector of the game benefits from the system’s powerful functionality. And Sports Office Business Development Manager Tom Leather says the company is pleased to have played a part in supporting the success of all teams and of women’s football as a whole. Source: Manchester City Women Twitter. Manchester City Women celebrate their 2017 FA Cup victory. They are one of several elite women’s teams which use The Sports Office performance management system for elite soccer. The Sports Office online performance management system for elite soccer supports managers, coaches and fitness practitioners involved at professional level. The system provides an extensive range of features to support football coaching, video-usage, sports science, sports medicine, scouting and recruitment, squad management and intra-club communication. It also offers extensive statistical analysis for football, training load management and allows the creation of personalised performance and development plans for players. Women’s football is set for further profile boosts in the coming months. The UEFA Women’s EURO 2017 kicks off this July in the Netherlands and for the first time, the tournament will involve 16 teams. The FA have also recently launched Gameplan for Growth, which is a drive to double participation and grow the fanbase. The Sports Office works with more than 100 professional football clubs, competing in the world’s most high-profile competitions. Several major national governing bodies have also chosen to adopt The Sports Office. One of these is the Scottish FA, who use it throughout their structures, including for all their national teams and at all seven of their Performance Schools.